In urban areas where conventional storm water BMPs are increasingly expensive, a very high-efficiency storm water method for the roof is needed. 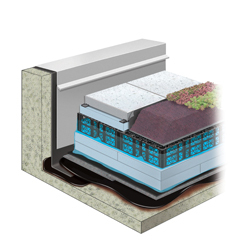 Hydrotech has developed its series of blue roof assemblies to handle very large quantities of water on the rooftop. Whether it is within a typical stone ballasted PMR assembly, a concrete paver surfaced roof or the Garden Roof assembly, very large quantities of storm water can be temporarily stored on the roof.